Can my pet suffer from sunburn? sun’s harmful rays- but what about your pet? Should they get the same protection that we do? The answer is yes- with some caveats. The fact of the matter is- your pet can suffer from sunburn if exposed to too much sun. In our semi-tropical climate, we can feel the effects of sunburn in as little as 30 minutes (or less depending on your tolerance)- and the same goes for our pets. But it’s likely that the sunscreen that you prefer for yourself may not be the best for your pet- and in some cases may actually be harmful. 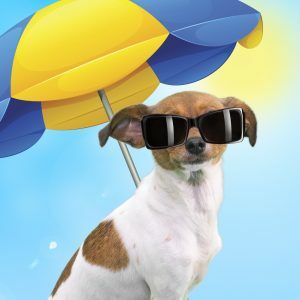 Does my dog need sunscreen? If your dog spends plenty of time outside in the sun, yes. The sun’s damaging rays are just as bad for your pets as it is for you. As a general rule, the thinner the coat or the lighter the skin- the harder the sun is on your pet. There are other times when sunscreen may be necessary- even if your dog has a thicker coat. If your pet has recently been groomed- and they’ve got less hair than normal, consider using sunscreen. If your pet has recently had a surgical procedure where a shave of their coat was needed, sunscreen is a good idea. Don’t put sunscreen on their sutures, but apply it around the sutured area. These areas probably never see the sun’s rays, so protection is important to prevent sunburns. 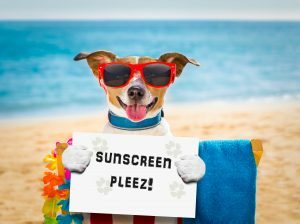 Zinc Oxide is found in lots of different types of sunscreen products, and must be avoided for your pet. Be sure to read the label and check the ingredients- just because a product is sold in a pet store doesn’t necessarily mean that it is 100% safe. Zinc Oxide is toxic if ingested, and can lead to anemia, vomiting, diarrhea, nausea and more. It is important to remember if you apply a sunscreen to yourself that you do not allow your dog to lick it off of your skin, as the results may be toxic. I have found only one sunscreen for dogs that has been approved by the FDA. We are looking into carrying this product- and will let you know if we are able to get it in stock. Until then, it is available via numerous online retailers. It is called Epi-Pet, and has an estimated SPF rating of 30 or greater. At a minimum, use nothing less than 15 SPF. I like the idea of this product since it is approved and has been tested by the FDA. If you’re not interested in using sunscreen products like sprays or lotions- you may want to consider purchasing shirts for your pet- which are SPF rated to protect your pooch. Yes, this is a real thing. I’ve found a fun company that manufacturers shirts for your pets-www.solardogz.com. At this time, they’re only making them for dogs up to 26 pounds. Hopefully they’ll consider making them for larger breeds soon, too. If you’re planning on spending lots of time outdoors with your pet, don’t forget to take a look at my other summertime blogs on keeping your pets safe- and cool in our Florida heat. That blog can be found here.